Over the past year, this thesis has evolved from it’s original concept of power structures in Massively Multiplayer Online Role Playing Games (MMORPG’s) to an analysis of the detrimental effects of the meritocratic distributive mechanism within societies, in particular, the social framework of an MMORPG. A question that is often posed is why pair a socioeconomic distributive mechanism with very real dynamics with a genre of video gaming that is rooted in the virtual. It is believed that, while meritocracy in a pure form is a practical impossibility, elements of the process in its various states of degradation are amalgamated with current social structures, which affect us all. Millions of people now partake in the virtual worlds of MMORPGs and understand the emotional investment required by the characters they make and by other characters created by other participants, make it more than just a game. Rather, many see it as an alternative to real life. The uniqueness of the virtual social structure, as found in the virtual worlds of MMORPGs (and, in fact, any persistent multi-user virtual world) is that they provide an environment, in which, meritocracy, in as close to its pure form as allowed by the scope of human nature, can flourish. As MMORPGs can be seen to be a reflection of real world society, the reason why it is so important for them to be researched academically, lies in possibility for them to provide an insight into our society’s undercurrents. And, it is in the same vein that this thesis was conceived. The conditions of the meritocracy within MMORPG virtual worlds has come to mean a great deal to a large number of ordinary people, not only to those that are “inside” the virtual worlds, but also to those outside it, as well, such as the developers, publishers and community built around it. 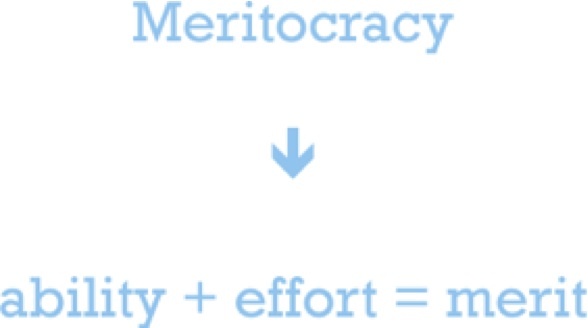 The defining characteristic of meritocracy, and also the most understood facet of it, is this simple equation, first proposed by the originator of the term, Michael Young in his seminal work, The Rise of Meritocracy (1958), and further refined by such theorists as Richard Hernnstein (1973), Arthur Jensen (1969), and McNamee & Miller Jr. (2004). The above equation is also strikingly similar to the ideals of equal opportunity, and, for many, including egalitarian Brian Jackson (1964), and the nations of Britain and Singapore (which currently continues to pursue a meritocratic educational process), meritocracy is still seen as the way to achieve equal opportunity within society. However, this essay, the presentation it follows, and the thesis it is based on, will argue that it is not a method of achieving equal opportunity, rather, it is, in fact, one of the most divisive and socially polarising ideas in contemporary society, and fundamental to the realization of interminable inequality. The advantages and disadvantages within a meritocracy come in two phases. These coincide with the first generational cycle after the inception of a meritocracy and all generations thereafter. In its purest form (as outlined earlier, a practical impossibility), the first phase of a social structure driven by meritocracy has its advantages and disadvantages, which would be comparable to what is expected of today’s western capitalist democracies. It is only after this first generation has embedded itself into the fabric of society and begins producing the subsequent generation that it becomes apparent the self-destructive nature of meritocracy as a function of society. Using the framework of modern day MMORPG virtual worlds* (and the Singaporean Society in the case of the thesis), this essay aims to outline the process by which the societal distributive mechanism of meritocracy, from its inception to future generations, and demonstrate it’s self-destructive progression. * Modern day MMORPG virtual worlds refers to the MMORPGs launched within the last 15 years, the earliest of which was Ultima Online, launched in 1997 and published by Mythic Entertainment. Richard Garriot, first used the term MMORPG in reference to this franchise, which he was the creator of. We take, as an example, an imagined situation starting with two children named Monica and Joey. Neither of them have biological relatives, nor do they have any predecessors. Monica and Joey are test tube babies born of entirely new DNA, and are, essentially, blank slates. They are then thrown into a meritocratic system, where they are compelled to develop their abilities; we would see this as a system of education. Both apply the maximum amount of effort that their abilities afford them, and both reach the height of their potential. Joey ends up as a prodigious gardener, while Monica rises to an executive position in a company that specializes in the interior design of high-rise office buildings, owned by large multinational conglomerates. Certain theorists, such as Brand (1996), and Jensen (1969) would see this distributive process of meritocracy as advancing society – a derivative of social Darwinism. This interpretation is connected to the first problem of meritocracy. 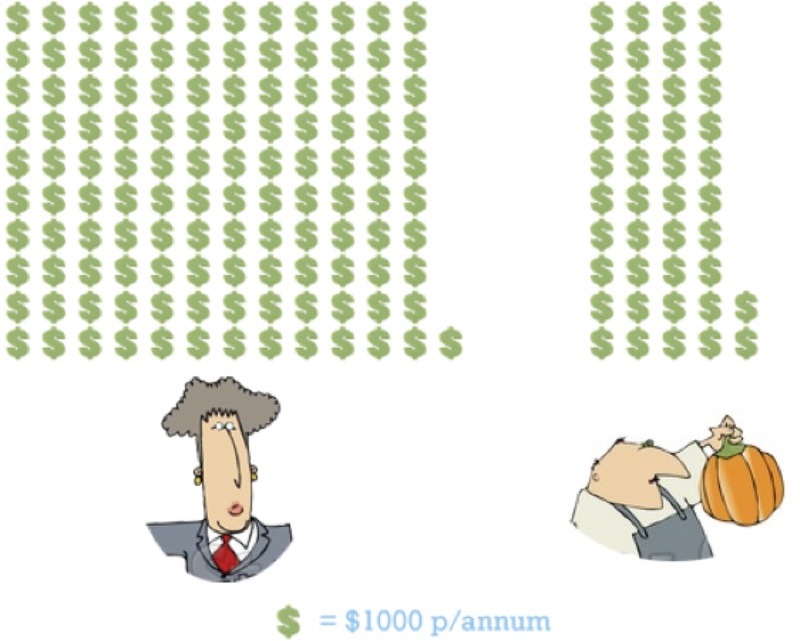 If we accept that a meritocratic society is monetarily driven, financial rewards are given in exchange for demonstrated merit, then, going by the example of average Australian wages in these industries, the question must be asked: is there a reason why Monica is earning almost 300% of what Joey is earning? Within the meritocratic framework, one must ask, is Monica exhibiting 300% more effort than Joey? Or, does Monica possess 300% greater ability in her field than Joey? While differences between individuals understandably exist, it is highly improbable that the difference between the “demonstrated merit” of Joey and Monica is so monumental. So, if neither lack in ability nor effort, what differentiates these two individuals? In the case of the meritocracy, it comes down to the definition of merit. According to Ruth Lister’s (2006) points on the deficiencies of a meritocracy, she notes that a meritocratic distributive principle is based on narrow definitions of what “merit” is and what is of value to society. In the case of Joey, unfortunately, in this society, his ability to grow an excellent pumpkin does not rate highly in value to society (ironic, considering human’s fundamental need of food). This results in low pay, low socio-economic status and, because these definitions of merit are rarely questioned in society, low self-esteem. It is this differentiation between types of “merit” that, not only can be seen to have a tremendous impact on social justice. It is also is a reason why the meritocratic distributive principle cannot help but continually undermine itself as an allocative mechanism of equal opportunity, for what is equal when the defining of what is “merit” is decidedly un-equal. If this example is extrapolated into a second generational cycle, the self-destructive nature of meritocracy becomes apparent as social stratification becomes systemic, with elements of nepotism, inevitably occurring. Say, Monica and Joey decide they would like to have children of their own and along comes Rachel, Joey’s daughter, and Ross, Monica’s son. Like their parents, Rachel and Ross are also thrown into a meritocratic system and are compelled to develop their abilities. However, unlike their parents, they have potential access to wealth generated and accumulated by their parents. As is often the case, the natural instincts of the parent dictates that both Monica and Joey attempt to give their child every chance to succeed. However, with significantly more wealth accumulated, Monica is able to give Ross an education at a more prestigious institution than can be afforded by Joey for his daughter, Rachel. Even if Rachel was demonstrably more brilliant than Ross, discounting other environment factors, the major environmental factor that Rachel now has to deal with is her own family’s resources. Ross has access to his mother’s wealth and societal connections, and an education at a prestigious school, which, if it not to provide a more comprehensive education, then at least it can serve to generate social capital at an accelerated rate. While it is not to say there would be entirely no effort required on Ross’s part, at worst, Ross would likely secede Monica in her professions, but, even more likely, with comparable effort and ability, he would develop wealth and social capital at a much faster rate than Rachel could. From this extended example, there are four ideas we can conclude are the detrimental effects of meritocracy on society. Firstly, in its initial phase following inception, we have determined that in order for the distributive mechanism of meritocracy to operate, for opportunity to be taken advantage of, the notion of what is meritorious and what is not must be defined. However, in society, the definition of what “merit” is and what is of value to society is narrow (the more narrow the definition is, the more inversely disproportionate the compensation for those with the right kind of “merit”) and rarely challenged. Thirdly, the notion of meritocracy, that each individual determines the scale of their own merit, combined with both the socially stratifying effects of it, and the discriminatorily narrow and rarely challenged definition of what is “meritorious”, leads to a widening gap in the self-confidence between those who are of low socio-economic status and those who are of relatively high socio-economic status. As the self-confidence of those of low socio-economic status continues to erode, within a meritocracy, they are likely to reflect on their situation as a result of their own failures, leading to apathy, self-loathing and further distancing themselves from seeing the possibilities of change. In the most basic terms, an MMORPG is a virtual world. Apart from niche text driven worlds, most of them are visually depicted. Millions of participants are, nowadays, connected to these virtual worlds via programs installed on their computers called clients. Each of these participants has created characters (often more than one) to inhabit these worlds** and they are all able to see each other and interact with the world in real time. This is the “MMO” side of things. The reason why this genre of games is labelled MMORPG is that the virtual world employs elements derived from role-playing games in order to motivate, entertain, educate and allow players to interact with each other. Within the nascent research field of MMORPGs major work is being done on important subjects such as issues of economics, governance and ownership (Dibbell, 2006, Castronova, 2005), the pedagogical potential of virtual worlds (Steinkuehler, 2004), the nature of relationships within these worlds (Yee, Ducheneut, 2006), and the possibility of identity exploration (Turkle, 1995). However, in this second major portion of the essay we will be dealing with the existence of a meritocratic societal distributive mechanism within the virtual worlds of MMORPGs, having already established the detrimental effects of such a mechanism. So, what has meritocracy got to do with MMORPGs? What has meritocracy go to do with MMORPGs? 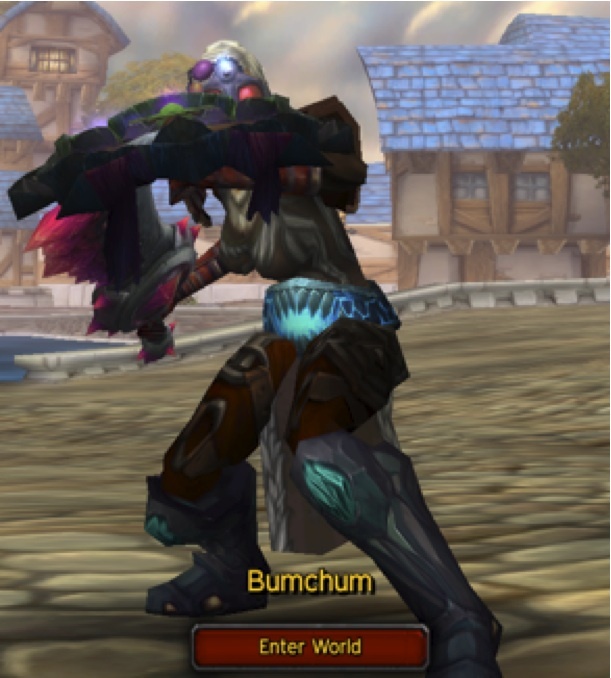 Above, is my character that resides within the MMORPG of World of Warcraft. I am a participant within the virtual world of Jubei’thos*** and have been actively so for more than twenty per cent of my waking life for the last six years and two months. During my time in this virtual world, as well as in countless others+ I noticed that, even in non-traditional worlds, people gravitated towards traditional social structures, and, just as in our earthly reality, jostled within the distributive mechanisms of that society to secure power. All of these worlds had similar game design elements, elements that were conducive to creating a meritocratically driven social structure. Although the forms and labels with which inequality occurs may differ, there are structures equivalent to those existing within a meritocracy, which perform in much the same way. For example, there still exists two phases within MMORPGs, which could be considered analogous to the generational cycles presented previously. While, the first phase of total equality in opportunity within a completely vacuum initiation can never occur in reality, it is a brief reality within MMORPGs and is one of the strongest motivations for people to join the virtual world – the lure of escapism and the potential of starting with a completely blank slate. However, while the concept may remain as a marketing tool, the reality is that, it will erode further and further as more time passes and with each new inductee. So the self-destructive cycle of meritocracy begins. *** In many MMORPGs, particularly ones with a large user base, the user base may be split into many different virtual worlds (contained on computer servers). In most cases these different virtual worlds are estranged from each other. + Others include Final Fantasy XI and XIV, City of Heroes, Champions Online, EVE, Conan, Warhammer, Tabula Rasa and Fury. What is the Process (in MMORPGs)? It is using this same transcendence of the paradigm of the participant-character relationship that it becomes apparent that a participant’s stable of characters can also act and progress in much the same way as the more traditional family structures discussed previously. To outline the distributive mechanism of meritocracy within the virtual worlds of MMORPGs, we look to another hypothetical situation. Take two characters: Bullet Face and Axe Smash. Both are new to the virtual world within MMORPG-landville. As in the earthly reality, both are thrown into a meritocratic system where they are compelled to develop their abilities, in fact, a system of grading even exists within this world, much like grading within education, although it is referred to, instead, as “levels”. Through their actions Axe Smash finds that he derives greatest enjoyment in moulding metal and stone into all sorts of useful tools, weapons and armour. Bullet Face, on the other hand, joins a band of adventurers to gleefully bludgeon her enemies with extreme prejudice. 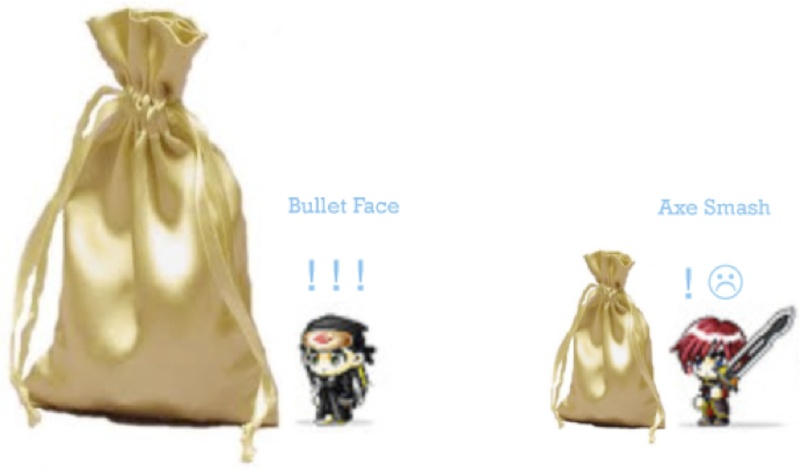 Axe Smash’s income will be currency exchanged for the goods he creates, while Bullet Face is left to scavenge from the bodies of those she has slain. It can be said that neither lacks in ability nor effort in their skill (in fact, within an MMORPG it is possible to be quantifiably “equal”), yet Bullet Face will earn significantly more than Axe Smash. Consequently, as a demonstration of the differentiation of merit it can be said that ones ability to kill is defined as more meritorious and of greater value to an MMORPG society than a nice pair of chainmail pants. The differentiation of merit exists not only in occupation, but also between the performances of different characters in a combat situation. This relates to the reliance and obsession of many of these games on quantitative performance data. Classes, or types of characters, where their style of play is not conducive to producing large numeric values in performance data tables (accessible by participants using client-based applications) experience the same lesser value in the eyes of society, just as Axe Smash has as a craftsman. These are utility or support characters, such as damage preventers, such as tanks (which are characters which protect other characters by taking incoming fire), secondary healers (which are characters who seek to prevent damage than remedy it); and buffing characters, such as bards (whose sole purpose is to improve the abilities of others, but they have no primary function of their own). However, the socially stratifying effects of meritocracy become most apparent in the second phase of an MMORPG, after sufficient time has passed since the influx of characters at the virtual world’s inception. Depending on the breadth of the virtual world this can range from a week (in the case of World of Warcraft) to six months (in the case of Final Fantasy). Say, for example, Bullet Face decides to conceive another character, as does Axe Smash. They are named Bomb Face and Sword Smash, respectively. Leveraging on pre-existing wealth and social capital built accumulated by Bullet Face, Bomb Face, with relatively equal ability and effort in comparison to Sword Smash, would, likely, develop much more rapidly than what Axe Smash’s accumulated resources would allow Sword Smash to. A new participant who chose to join the virtual world at this point would develop much more slowly than either Bomb Face or Axe Smash. In this scenario, both Bullet Face and Axe Smash could be seen as equivalent to a parental entity, and Patrick Diamond and Anthony Giddens’ statement that the successful individuals of one generation lead to the embedded caste of the next, holds true. Meritocracy is shown to continually override equal opportunity and exacerbate social stratification with each generational cycle, or phase, within an MMORPG virtual world. Also, low self-esteem derived from low socio-economic status is not exclusive to reality, just because theorists such as Davies and Griffiths (2006) would see MMORPGs as just a computer game. In fact, the disinhibition of participants without a physical connection to their characters can often make the tension between different socio-economic classes more vicious and polarizing. An indicator as to the toxicity of the society within an MMORPG can be the amount of derogation of language evident within that society, where the mastery of the evolving lexicon could be seen as a marker for social dominance. This is similar to what was found by theorists such as Sherbloom (2002) in “l33t” subculture. Inevitably, as the cycle of merit driven inequality continues, unlike the earthly reality, despite all the emotional investment participants impart into their characters, it becomes comparatively easy to “pull the plug” as they and their characters becomes more and more disenfranchised with, what they see as a reflection of their failure, rather than systemic inequality. Due to the interminable inequality derived from the self-destructive cyclical nature of the meritocratic distributive process, as more and more participants “pull the plug”, the amount of participants “leaving” would begin to overshadow the number of participants willing to “join”. When the numbers of characters within the MMORPG virtual world can no longer maintain the critical mass required to sustain a society, that society collapses, and, as a business venture, the MMORPG no longer becomes commercially viable. Notable examples of this occurring can be seen in such MMORPG franchises as Tabula Rasa, and the catastrophic Fury, and All Points Bulletin. However, in conclusion, there is a caveat to this. Despite meritocracy’s detrimental effect to the long-term sustainability of a virtual world, it is, unfortunately, the only viable means currently available to the developers who design these worlds, to keep participants engaged. The constant struggle to attain, often unattainable power has a strange attraction to people. Bainbridge, William Sims. The Warcraft Civilization: Social Science in a Virtual World. Cambridge, Massachusetts: MIT Press, 2010. Print. Barr, M. D. (2006). The Charade of Meritocracy. Far Eastern Economic Review. Barr, M. D. (2006). “Beyond Technocracy: The Culture of Elite Governance in Lee Hsien Loong’s Singapore.” Asian Studies Review 30: 1-17. Brand, C. (1996). The g Factor: General Intelligence and Its Implications. London, UK, John Wiley & Sons. Brown, G. “An Age of Aspiration Can Benefit Everyone”. London, UK, 2010. (3rd January 2010): The Observer. 15th March 2010. <http://www.guardian.co.uk/politics/2010/jan/03/gordon-brown-education-aspiration&gt;. Castronova, E. Exodus to the Virtual World. New York, NY: Palgrave Macmillan, 2007. Print. Castronova, E. Synthetic Worlds: The Business and Culture of Online Games. London, UK: University of Chicago Press, 2005. Print. Castronova, E. “Virtual Worlds: A First Hand Account of Market and Society on the Cyberian Frontier.” Working Paper. CESifo, 2001. Print. Chappell, D. Eatough, V. Davies, M.N.O. Griffiths, M (2006). “EverQuest —It’s Just a Computer Game Right? An Interpretative Phenomenological Analysis of Online Gaming Addiction ” International Journal of Mental Health and Addiction 4(3): 205-216. Diamond, P. Giddens, A. (2005). The new egalitarianism: economic inequality. The New Egalitarianism. Cambridge, Polity: 108. Dibbell, J. (2006). Owned! Intellectual Property in the Age of eBayers, Gold Farmers, and other Enemies of the Virtual State Or, How I learned to Stop Worrying and Love the End-User License Agreement. The State of Play: Law, Games and Virtual Worlds. New York, New York University Press. Ducheneaut, N. Yee, N. Moore, R. Nickell, E (2006). Alone Together? Exploring the Social Dynamics of Massively Multiplayer Online Games. Games and Performance. Montreal, Quebec, Canada. Eckland, B. K. “Genetics and Sociology: A Reconsideration.” Atlantic Monthly 32 (1967): 173-94. Print. Fogel, S. (2010). “Four of the Shortest-Lived MMOs.” Last Updated September 20th, 2010. Retrieved January 29th, 2011, from http://www.gamezone.com/editorials/item/four_of_the_shortest-lived_mmos/. Gottfredson, L. “Mainstream Science on Intelligence.” Wall Street Journal (1994). Print. Hernnstein, R. J. I.Q. In the Meritocracy. 1st ed: Little, Brown & Co., 1973. Print. Jackson, B. Streaming. Routledge & Kegan Paul, 1964. 141. Print. Jensen, A. R. “How Much Can We Boost IQ and Scholastic Achievement.” Harvard Educational Review 39 (1969): 1-123. Print. Lister, R. (2006). Ladder of Opportunity or Engine of Inequality? The Rise and Rise of Meritocracy. G. Dench. Oxford, UK, Blackwell Publishing: 232-236. McNamee, S. Miller Jr., R. The Meritocracy Myth. Lanham: Rowman & Littlefield Publishing Group, 2004. Print. Sherbloom, B. (2002). Hackers, Gamers and Lamers: The Use of l33t in the Computer Sub-Culture. Steinkuehler, C. A. (2004). 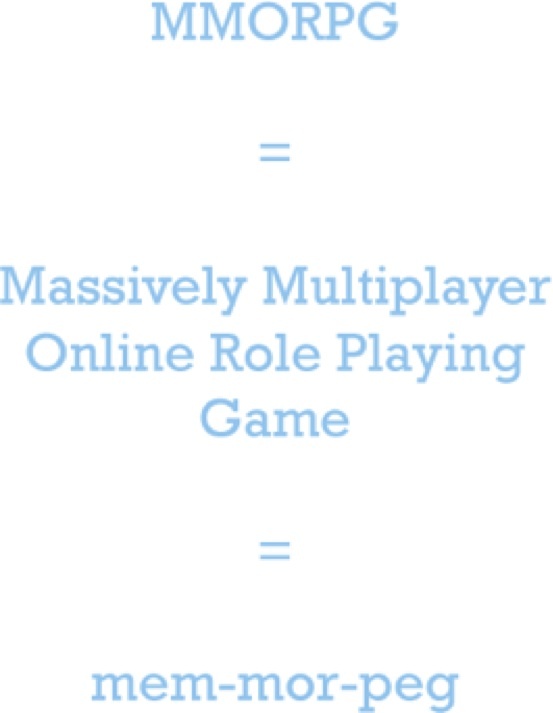 Learning in massively multiplayer online games. Proceedings of the Sixth International Conference of the Learning Sciences, Mahwah, NJ. Taylor, T. L. Play between Worlds: Exploring Online Game Culture. MIT Press Paperback ed. Cambridge, Massachusetts: MIT Press, 2006. Print. Turkle, S. (1995). Life on Screen: Identity in the Age of the Internet. Massachusetts, MIT Press. Young, M. The Rise of the Meritocracy. London: Thames and Hudson, 1958. Print. Young, M. (2001). Down with meritocracy: The man who coined the word four decades ago wishes Tony Blair would stop using it. The Guardian. This entry was posted in Theoretical Work and tagged meritocracy, mmorpg, social structure, theory, virtual world. Bookmark the permalink.